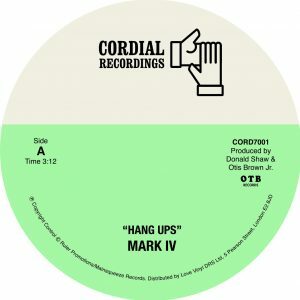 Mark IV have long been respected on the soul scene for songs such as ‘If You Can’t Tell Me Something Good,’ ‘Signs Of A Dying Love,’ ‘I’ll Be Right There,’ ‘My Everything You Are’ and many others. As a group they released one self titled album on Mercury Records and were managed by Roy C Hammond during this time. 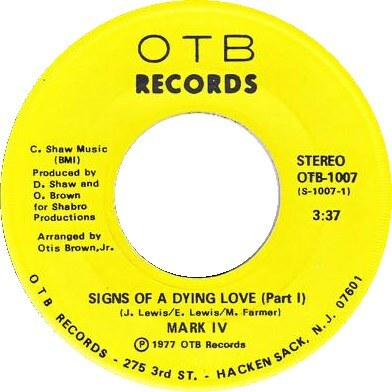 After this arrangement ended Otis Brown and Donald Shaw took over the management reigns and released the ‘Signs Of A Dying Love’ on OTB Records. 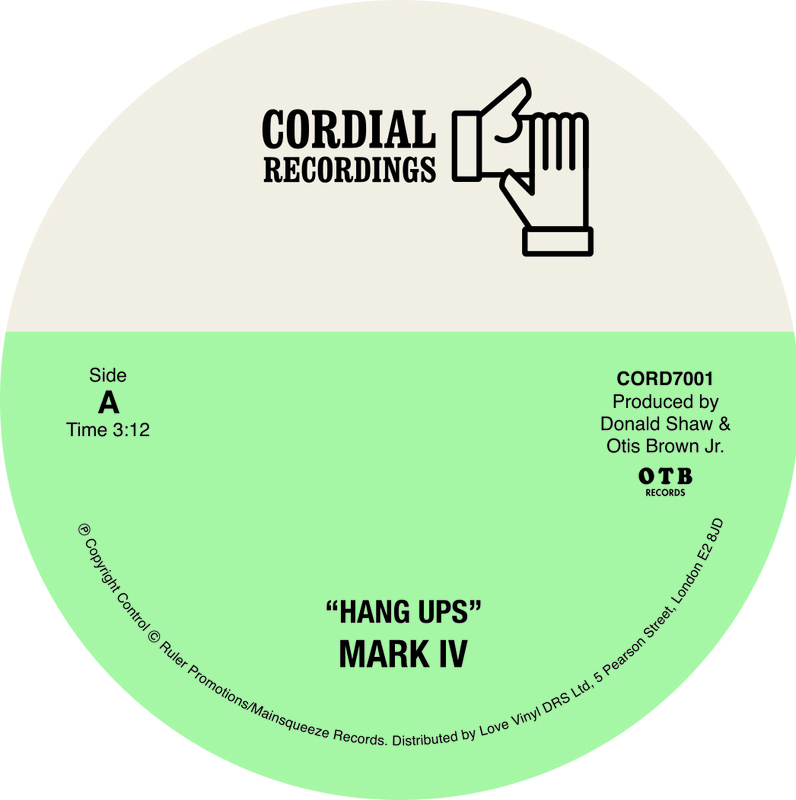 During their time with Mark IV there were three recording sessions in total which have remained in the vaults until this year and a partnership between Cordial & Otis Brown was developed. We have an album planned for 2018 with a number of singles too in the pipeline. We’re in touch with one member of the group and are looking for contacts for the other three members. Please contact us if you can help! We interviewed Otis in order to learn more about Mark IV and his time with the group. Are you from New Jersey originally? No I’m actually from Summerville, South Carolina originally. Summerville is this little town near the east coast. I attended South Carolina State University in Orangeburg, South Carolina. .
Was your introduction to music was playing the drums? Yes I started playing in a rhythm band in third grade. Actually they were out of instruments and I was just clicking some sticks together with the band just to be in it. Then when I moved up to sixth grade I started taking band with the music teachers and when in seventh grade I actually started taking drums lessons. That was always my fascination, the drums. I’ve played drums ever since. I went to college on a scholarship to be in a band – marching band, jazz band, and concert band. I actually majored in music. Which were the first r’n’b or soul group that you played with or were you playing jazz when you went of school? In high school our band director, Aaron Brown, organised a rhythm and blues band. When I was a junior in high school. Organised a band of high school musicians which he called The Shades Of Brown. I was the drummer. He put this band together and we ended up playing at school proms and doing local events in the town of Summerville. We were making money in high school doing what we loved to do. We used to put on our own shows. We did a show at the National Guard Amory in Summerville and everybody in the town came to see us play. They were very proud of us being young boys in high school putting together a band, selling tickets and putting on a big show. It was such a wonderful event. I remember at the time Archie Bell and The Drells had just put out ‘Tighten Up.’ We had learned to play it but we didn’t feel very comfortable playing it for the fans. All our friends said “come on guys play it, we know that you guys aren’t Archie Bell and The Drells, but just play it.” We ended up playing that song at the show and Roual, I tell you it was a big hit. From that point on I said that this is what I wanted to do, to play music. This was in 1968. I did some local hustles with construction companies and things like that, but from that point I started playing with some adult brothers. The guy’s name was Guitar Wash. His name was Washington but he called himself Guitar Wash for short. He played guitar and his brother played bass. They latched onto me somehow or I latched on to them so I ended up playing with them out in the country at the Country Clubs, homes and ranches. They paid me a pretty nice little penny so I was making money with them as well. That was a nice little side hustle for me, making a few dollars here and there. So what happened afterwards up until you got involved with Mark IV, which I believe would have been 1975? I went to South Carolina State in the fall of ’69. I organised a group with a friend of mine, which were called….no actually I started playing with a group called The Charades. You know once you get into a town and you can play half decent you’ll find yourself a band to play with. I ended up playing with a group called The Charades as a freshman in college. This was a local group in Orangeburg, South Carolina, but they had a nice reputation and a nice following. In that year with that group I ended up playing with Candi Staton when she had her first hit and later on we backed up Betty Wright when she did ‘Clean Up Woman.’ I can’t remember what Candi Statons hit was at the time, but we backed her up. We played a lot of clubs, proms and things of that nature. Then as a sophomore a friend and I organised a group called A Different Bag because we wanted to be a little different from all the other local groups. We played at many functions. We actually played at a College in Alabama. We went to Talladega State for some prom or something that they had there. I remember it so well because when we came back our van broke down on the road in the middle of nowhere, but we found a way to get back home. When I became a junior there was a group there called the Soul Agents, which was one of the premier groups there in Orangeburg. There were two of them. The Exotics was one of them and The Soul Agents was the other. The drummer with The Soul Agents was also in the college marching band with me. He graduated and the group asked me to be their drummer, so I played with The Soul Agents in my junior and senior years in college. As a senior in college, the most outstanding senior musician gets to orchestrate a piece for the Wind Ensemble to play . I did an arrangement of ‘Ellies Love Theme’ from the movie Shaft. One of the notable musicians that had graduated from South Carolina State was invited back to do some music that he had done on Broadway. He brought Bernard Purdie and Dave Spinozza with him. We rehearsed his music in preparation for the spring concert. Then after we rehearsed their music Prof told me to go ahead and rehearse my arrangement of ‘Ellies Love Theme’ with The Wind Ensemble. Those guys heard it and said “Prof that’s pretty good. Can we play along with that?” Prof said “Hey ask Otis.” They said “Otis can we play with you.” I said “You New York cats want to play with my stuff, I said ABSOLUTELY!.” They said “Do you have the lead sheets?” I gave them the lead sheets and I go these guys from New York to play my arrangement with the Wind Ensemble at the college. It was really a big hit. So Bernard Purdie asked me “What are you going to do when you leave college?” I said “I’m going to pursue a career as a professional career.” He gave me his card and said “Next week you’re on spring break, give me a call.” So I called him and he asked my wife and me, I was married at the time, to come up to New York to arrange two songs for a movie that he was doing. I did it. The rest is history. I ended up in New York working for Bernard Purdie. I worked for him for quite a few years. I actually helped him write his first drum book. I just hit the New York music scene from there. I went on and actually played with an artist being produced by Roberta Flack. I also did a little stint with the Main Ingredient. One thing I forgot to mention was that when I was a Junior college, The Soul Agents actually played with James Brown for about a year. We were on the road with James Brown and Bobby Byrd in my Junior year at College. You know I actually did a few nice things as I was coming along. What was James like to work with? James was a hard task master. He fined his musicians whenever they made a mistake. He was really a perfectionist with what he did. He was just a professional all around. He worked his musicians hard, but nobody worked any harder than he worked. But that’s how I ended up in New York, at the request of Bernard “Pretty” Purdie. So you’re in New York, what year would have that been? We got into New York in late ’73 and I was working with Bernard Purdie doing some arrangements for local artists. Playing local gigs. I ended up playing with a group called Evolution II, led by my friend and guitarist, David Baron, who is now deceased. We played all over New York. I was doing some musicals, weddings, some poolside parties. You name it and we did it. That was what we did in ’73 to ‘’74. Then in ’75 that was when I actually played with the Main Ingredient for a short stint. I got that gig through Bernard Purdie. Would that have been the year that you met Mark IV? I met the Mark IV I would have to say in 74 or 75. I can’t remember the exact year that we did ‘Signs Of A Dying Love.’ I think that it was ’75. You know these years all seem to come together on me, Roual. Can you remember how you met Mark IV? Well what actually happened was I ended up teaching music in a local middle school in the city of New Jersey and I met a producer there called Donald Shaw. I met him and he found out that I was a musician and teaching music. We made a connection and somehow someone told him about the group the Mark IV that was available. They’d just come off the road with Roy C Hammond. They said that they were looking for a producer, a manager and someone to record them. I think Melba Moore’s husband at the time was going to finance the music and my partner Donald and I were going to produce it. So I ended up writing music day and night for about two weeks getting all these string parts, horn parts and everything written. Then just before we were going to go into the studio to do the recording he backed out, so when he backed out I was sitting there with all this music and didn’t have the money to go in and record it. My partner called and said “T, he called me T for short, let’s just take this group. We’ll sign them to a contract. You’ll do the music, we’ll produce them and we’ll see if we can get them a deal. So that’s what we did. I got a band together. I rehearsed the band, that way with rehearsing the band you’re sure to get what you want when you went to the studio. We rehearsed a couple of times a week in a friend’s apartment in New York. I mean we rehearsed really hard, so the band was really tight when we laid down the tracks for the one’s I’d written the horn and string parts for. What we actually did Roual was we laid down everything on the same day which was the norm back then. We laid down the rhythm section, then after I had in time the horns would come in after the rhythm section. Then after the horns came I had it in time so that the strings would come in. We had a full day in the studio putting down the tracks with the rhythm, horns and strings. Then of course we went back later to do the vocals. You’re really challenging my memory. That session included ‘Give Me Just A Little Love’ and ‘Hang Ups.’ Let me just go back ‘Signs Of A Dying Love’ was originally done a little differently and the musicians on that were not the same musicians that’s on ‘Hang Ups’ and ‘I Knew It Wouldn’t Last’ because I was just going to go into the studio and record ‘Signs Of A Dying Love’ in New York and I recall that the piano player that was supposed to do that session couldn’t make it. I had to get a substitute at the last minute and we did a quick rehearsal in some studio in New York. I’d have to ask Donald Shaw on where that song was actually recorded because all of this stuff is running together in my head. There is two versions of it because we did one of them when we did ‘Hang Ups’ and ‘Give Me Just A Little Love.’ The guitar player that played that solo on ‘Signs Of A Dying Love’ and all the other recordings with us is at the House Of Music in West Orange New Jersey. So you’re right there’s two versions of it. I really should have Donald Shaw with me because sometimes his memory seems to be a bit better than mine. There appears to be three different recording sessions by Mark IV. There’s certainly three different master tapes! Yes and as I told you the ‘Signs Of A Dying Love’ 2 inch master was destroyed by a fire in a garage that I owned so I’m fortunate to still have the other tapes. I had one 45 that I cannot put my hands on because I don’t know where it is. The reason is that I was with a friend who was showing me how to put it on YouTube or somewhere that I could at least get royalties from the plays that the song was getting. It was getting plays all over the place and we weren’t getting any money from it. So we put it on to see if we could get some pennies. Of course I haven’t seen any yet. So we did that song ‘Signs Of A Dying Love’ which was in our opinion the strongest that we had and the most ready. That’s why we put that out on the OTB label. I actually got a signatory from the local musicians union in Passaic, New Jersey. I had to go before their board and they asked me what my intentions were. Was I going to contribute money to the musicians fund, blah, blah, blah and I said yes, yes, yes. They gave me this signatory so we started the label. We were actually trying to get a major label deal with the Mark IV because we had all the stuff ready. We had a consultant who had worked with Epic Records and her name was Diane Hyatt. She worked with us every step of the way. We submitted our stuff to all the major labels trying to get a deal and she took it to Epic because she was pretty certain at the time that Epic were going to sign the group and the word was out in the industry that Epic were going to sign Mark IV. Then Epic had a shake up with their executives and the new President who came in said that they’re not taking any new artists because we’re not doing justice with the artists that we have. So that deal fell through and because of it all the other companies had backed off beforehand because they all knew that Epic were interested. 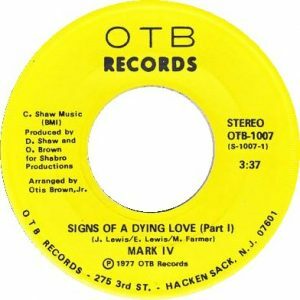 When the Epic deal fell through we had no deal with any record company and no one wanted to touch it after that so we decided to put ‘Signs Of A Dying Love’ out on our own label. Which is how OTB came into existence because we had to have a vehicle to put our record out, so we put it out on OTB. Did you have any distribution for OTB? No, we did it all ourselves Roual. We got the record to the one stops and fought for some airplay here and there. We never really got any real air play on the record. I don’t know how the record got out there to be recognised. We got some local play in the south because we took the group on tour down south and a lot of promoters could at least put a song on the advertisement on the radio with a little snippet of the record. The Mark IV had a little following in the south. Once a record is put out on a label it gets a little more credibility than just throwing it out there on its own. I don’t know how it got any notoriety because I know that it’s being sold on the internet for hundreds of dollars per copy. We went to some sites where they were selling it for a four hundred dollars per copy. I know that they’re bootlegging it and we figured that we needed to do something and that’s why I’m glad that you reached out to me. Do you have memories of each individual member? I remember Jimmy because as the lead singer he was definitely the most talented and he didn’t have any difficulty singing from deep within his soul, whilst putting all his emotions and expressions into everything that he sang. You never caught him at a moment where he was laid back. He just gave his all. He was a dynamic singer and he was always in good voice. He was willing to try anything that you asked him to try. He never pushed back on anything that I asked him to do. As the musical director, I found him to be a top notch performer and he gave everything that he had. There was also Walter who had more, for the want of better words, a more popish kind of voice. He sang songs like the Gibb brothers and Leo Sayer. He actually sang one of Leo Sayer’s songs when we put them on the road. He had that little crispier sharper edge to his voice. So I remember Jimmy Ponder and Walter Moreland. Then there was Buck. I’m trying to remember Buck….Buck had a voice that had a lot of range to it. He could sing the high tenor parts. He could sing baritone. For the road show, we gave each one of them lead to one degree or the other. We made sure that they all sang lead on something. They didn’t just do a repertoire of Mark IV songs because the repertoire was very diverse. Then there was the other guy Preston, who was basically a harmony guy. He never really sang any lead. He just rounded up the harmonies of the group. You gave him his part with his notes and he just sang them. That was just his role. Buck, I can’t remember his real name. If I had to guess it would be Lawrence Jones. So the group as I recall was Preston, there was Buck, Walter Moreland and Jimmy Ponder. Was Preston in the original line up or did he join after Mercury? When I got the group they were the four that were there. If there was any changes before that or after our time I wouldn’t know. Those were the four that we had. So you released ‘Signs Of A Dying Love’ and you took the group on tour. When did your relationship with Mark IV end? We took the Mark IV on tour with a really nice tight band. If I had to tell you who the band members were I couldn’t, but I can describe them. I had a trumpet player and I think his name was Jonathan Pratt. I had a bass player and his name I think was Peter Brown. I don’t know if he went on to be the great Peter Brown. There was a keyboard player and I don’t remember his name but he was really the musical director at the time for the band that was on the road. I can’t even picture the guitar player. We got the band together, the repertoire together and the group went on the road with a Southern tour. We hit Alabama, North Carolina, Georgia and the group got really tight whilst we were out there performing. Of course that’s going to happen when you’re playing 3 or 4 nights per week. We got really really tight and when we got back to New Jersey the word got out that the Mark IV were available for bookings so we performed at a local club in Orange, New Jersey called the Orange Peel. We got a bunch of agents come out to hear the group and the show was so tight and the agents started bidding for the group. They were like “I can get these guys gigging all the way down the east coast every night every week.” Somehow something happened after that night at the Orange Peel the group started discussing who funded the group whilst they were on the road and whilst they were down and out. They saw money coming in and two guys went up against the other two guys in an argument and then a fight ensued. Then the next thing that you know Donald and I are standing in between the two sides to try to keep them from fighting. The club owner called the cops. The cops came and broke things up. Then we all went our separate ways. My partner Donald Shaw met with them separately. He met with Jimmy Ponder and another before meeting with the other two. He asked both sides whether they could reconcile their differences and they said “no they couldn’t.” When they couldn’t do that there was nothing else that we could do. If they couldn’t work together as a group we didn’t have a group. Believe it or not for the next six weeks after that the agents kept calling to see whether the group had gotten back together so that they could really put them to work. It didn’t happen. That was the end of that relationship. Tragic and sad, but that’s the way that it ended between the Mark IV and us. After that happened I didn’t follow up with the group. I ended up holding some speakers and equipment for them before Jimmy Ponder tracked me down I around 1980 or ’81 because he was going on the road or something and I had his speakers. I’d stored them at the Arts High school in Newark, New Jersey. I was the bandmaster at the time. He came by to collect everything and we exchanged pleasantries. That was the end of it. As a matter of fact when he came round I was putting out ‘Strut On.’ After the dispute at the Orange Peel, Donald Shaw and I sat down in his living room and we wrote ‘Strut On.’ We wrote that together, produced it and put it out. That was it. Just one more thing with regards Mark IV is that the two writers of ‘Sign Of A Dying Love’ were the Lewis brothers. How did you meet up with them because they appear to be interesting characters? They were very interesting characters. When you’re out there looking for songwriters and doing those kind of things somehow Donald Shaw introduced me to the Lewis brothers. They had a night club over in the Bronx and they had a friend called Farmer and they would just get together and write songs.. They used a reel to reel tape player and they would write these songs with Farmer playing a little keyboard. They’d put the music together and I would go over to their night club. I listened to what they had and I’d give them my input to do this and do that. They would do it and that’s how I met them. I met them in the Bronx. I don’t know the street that they were on if my life depended on it, but somehow I got there. We got ‘Signs Of A Dying Love’ from them those guys. I think they also did ‘I Knew It Wouldn’t Last.’ I can’t remember how many songs we got from them. From what I understand they left New York and went back to North Carolina, which was their home. I don’t know where Farmer is either, but I know that I’ve promised you that I would do some research, and see if I can track them down. What happened after Mark IV and ‘Strut On?’ What did you do next? After I did ‘Strut On’ Don and I produced quite a few artists. We did some hip hop. Some pretty good hot hip Donald owns the rights to that music. We were offered some advance money, but for some reason or the other it did not work out. For a while we just didn’t do anything. I’ve just finished working with Donald on a record with a young lady who is great and very talented. I don’t know what happening with that project. I’ve worked with Donald down through the years with various artists. The stuff was good but was never released. I did this last project with him that just finished up two or three months ago. I did it reluctantly because I don’t want to do music in the studio and it goes nowhere. I have records in my basement right now that if I don’t get somebody to take them I’m just going to have to chuck them. We put records out and didn’t do the necessary promotional work or the money to do it the way that it should have been done. One thing I’ve found, and I’m sure that you know it is that you have to have some money to really work it, to promote it, get some shows, do the mastering and the pressing. There’s a lot involved when you’re trying to do it yourself. If you don’t have the dollars to back you up it’s not going to work. That’s what I told Don that if we’re not working on a major label deal or that we don’t have the resources that we need to do as a label I just don’t want to be involved with it. He twisted my arm on this last one. One of your major accomplishment along with your wife is your son! That’s right Otis Brown III. He’s quite an accomplishment in his own right. He’s quite a musician I should say. He’s quite an accomplished musician for the level of people that he plays with and doing his own CD and in matter of fact he’s working on his new CD right now. He’s writing his music and getting it lined up and working on that. You know to play with the people of the caliber of Esperanza Spalding, Joe Lavano, Herbie Hancock and the list goes on and on. We, my wife Norma and I are very proud of him. Do you have any final words on Mark IV? The guys really worked hard back in the day. It was really great working with them. I had a lot of fun with the guys, whilst working on the songs and putting the vocal harmonies together. Giving them the business, whilst they gave me their business. We just had a lot of fun. They were a very talented group. They destroyed themselves because they had reached a point that they were going to achieve the success that they were after, but they couldn’t let their differences be in the past. They couldn’t reconcile with each other.